From totally innocuous through safe scary, all the way to “holy moly!”, the following fiction titles offer a scary experience for a range of readers and their comfort levels. They come at you from seemingly out of nowhere. The kid who side-eyes all your proffered adventure novels, mysteries, and silly school stories. The friendly fourth grader who sidles up to you and says, “Do you have anything… scary?” Don’t run! You’ve got just the thing for this situation, and it could be lurking on every shelf…. Horror is less a category than a flavor, making itself at home in any genre and every setting. Like a particularly loathsome pet hacking up hairballs in every room of the house, horror can be found in romance, sci-fi, and coming-of-age novels. 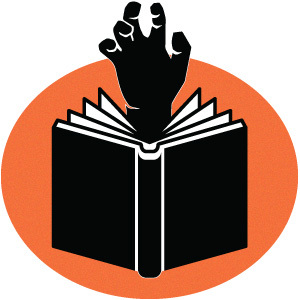 The metaphors of horror—the haunted house, the terrifying zombie horde, physical and mental transformation—apply particularly well to developing readers. And it’s easy to figure out how much scary is appropriate for a kid. Just ask. They may equivocate or shrug when asked if they like mysteries or books with talking animals, but kids are acutely self-aware of their tolerance for terror. Therefore, these books are listed in order by fear factor: from totally innocuous through safe scary, all the way to “holy moly!” Grade levels are more indicative of maturity of theme than reading level—many readers with trailing skills are attracted to high-stimulation content, so there are a fair number of so-called hi-lo books included. BRALLIER, Max. The Last Kids on Earth. illus. by Douglas Holgate. (Last Kids on Earth: Bk. 1). Viking. 2015. Tr $13.99. ISBN 9780670016617. Gr 3-6– Oh, it’s a zombie apocalypse, all right. With monsters. Slime monsters. But it’s mostly played for laughs as Jack and his pals battle their way across town to rescue Jack’s crush, June, who is holed up at school. Good stuff about friendship and sorrow sneaks in, camouflaged by nearsighted monsters and wacky weapons. Terrific, loopy illustrations ensure that only the characters are frightened. COSTA, Ben & James Parks. The Road to Epoli. illus. by Ben Costa. (Rickety Stitch and the Gelatinous Goo: Bk. 1). Knopf. 2017. Tr $18.99. ISBN 9780399556135. Gr 6 Up– Poor, melancholy Rickety! Fired from his dungeon-cleaning job, his only friend a wobbly cube of glowing blue goo, he has nothing better to do than to hit the road on a quest to find out exactly who he is—or was, since he is a decidedly dead ex-minstrel. Lots of gross details abound in this monsterrific graphic novel fairy tale. LUBAR, David. Ghost Attack. (Monster Itch: Bk. 1). Scholastic. 2017. pap. $4.99. ISBN 9780545873482. Gr 1-3– Lubar deserves special mention as a supplier of scary stories for readers of all ages. This new series introduces younger kids to his brand of well-written, unpredictable wacky fun, as Alex and his cousin Sarah solve a mystery aided by a ghost who communicates with Alex via a unique dermatological bond. O’HARA, Mo. Jurassic Carp. illus. by Marek Jagucki. (My Big Fat Zombie Goldfish: Bk. 6). Feiwel & Friends. 2017. Tr $12.99. ISBN 9781250063571; pap. $6.99. ISBN 9781250102607. Gr 2-5– Tom and his best friend Pradeep thwart the plans of their evil older brothers with the help of Frankie, Tom’s goldfish. Frankie has lots of useful abilities, including hypnotic zombie eyes and an unusual amount of dexterity for a goldfish. Three stories per book make this an excellent bridge into longer chapter books. HAHN, Mary Downing. One for Sorrow: A Ghost Story. Clarion. 2017. Tr $16.99. ISBN 9780544818095. Gr 5-7– A good old-fashioned vengeful ghost pitches a fit throughout the latest from the author of Closed for the Season and Took. The year is 1919, so the usual schoolyard politics that consume classmates Annie and Elsie are heightened by fears of deadly Spanish flu and anti-German prejudice. Let your readers’ first dose of Gothic horror be at the hands of a master. JOBLING, Curtis. Max Helsing and the Beast of Bone Creek. (Max Helsing, Monster Hunter). Viking. 2016. Tr $16.99. ISBN 9780451474803. Gr 4-8– Max is the middle school descendant of the famous vampire hunter Abraham Van Helsing—but unlike his more zealous forebears, he takes the time to listen before passing judgment on the beasts and monsters it is his duty to deal with. Combining mystery with monster mayhem, this series is like Scooby Doo’s more sophisticated cousin. MCGUIRE, Seanan. Every Heart a Doorway. (Wayward Children: Bk. 1). Tor. 2016. Tr $17.99. ISBN 9780765385505. Gr 9 Up– This short but extremely potent tale, first in a series, offers an achingly resonant metaphor to teens who feel out of place. All the residents of Eleanor West’s Home for Wayward Children insist that this world is not their real home. Written off as delusional by their heartbroken parents, not only are these children telling the truth, but one will do anything to get back where they belong. TERRY, Laura. Graveyard Shakes. illus. by author. Scholastic/Graphix. 2017. Tr $24.99. ISBN 9780545889551; pap. $12.99. ISBN 9780545889544. Gr 4-7– Fitting in at boarding school isn’t easy for scholarship students Victoria and Katia. Little Ghost has a similar problem: The other ghosts scare him. And poor Modie just wants his mad scientist dad to quit killing other children so that he can live. Darkly charming, this spirited graphic novel will appeal to fans of Raina Telgemeier’s Ghosts. WEING, Drew. The Creepy Case Files of Margo Maloo. illus. by author. First Second. 2016. Tr $15.99. ISBN 9781626723399. Gr 3-6– You can keep your vampire slayers and zombie hunters—Margo is a monster mediator! Emerging from the shadows to save the day in an extremely boss trench coat, Margo shows new kid Charles that their city neighborhood works better when its human residents respect the rights of the ogres, trolls, and ghosts who live there, too. Because nobody wants to get eaten. WHITE, Kiersten. Beanstalker and Other Hilarious Scarytales. Scholastic. 2017. Tr $16.99. ISBN 9780545940603; pap. $9.95. ISBN 9781338216202. Gr 4-6– Ever since Adam Gidwitz’s A Tale Dark and Grimm, fairy tales have been fine fodder for ghastly stories. In Beanstalker, the little girl in the red hood, uninterested in being good, doesn’t even make it halfway to Granny’s house before raiding the picnic basket. What she eats—and how it affects her—flips the script even further. Darkly funny mayhem pervades these intertwined stories. BAKER, Chandler. Teen Hyde. (High School Horror: Bk. 2). Feiwel & Friends. 2017. Tr $17.99. ISBN 9781250058751. Gr 8 Up– In this 21st-century retelling, Dr. Jekyll is a high-achieving teenage girl who maintains ironclad hold over her body, her grades, and her social connections. When something happens that challenges that control, she’s poised to break down completely. Bloody, satisfying revenge is found in this hi-lo selection. BAPTISTE, Tracey. Rise of the Jumbies. (The Jumbies: Bk. 2). Algonquin. 2017. Tr $16.95. ISBN 9781616206659. Gr 4-6– After defeating supernatural foes in The Jumbies, Corinne LaMer finds herself surrounded not with gratitude, but distrust. When a new threat appears, she must travel with mermaids and bargain with the mother of the ocean herself—gaining sometimes painful insight into jumbie nature and that of her own community as well. CÓRDOVA, Zoraida. Labyrinth Lost. (Brooklyn Brujas: Bk. 1). Sourcebooks Fire. 2016. Tr $17.99. ISBN 9781492620945; pap. $10.99. ISBN 9781492623168. Gr 9 Up– Alex wants nothing to do with her family’s practice of witchcraft, so much so that she tries to sabotage her Deathday coming-of-age ceremony. To her horror, this sends her family to the underworld, where she must go to find them. Latinx witchcraft with a decidedly ghoulish aspect and a little romance. GEMEINHART, Dan. Scar Island. Scholastic. 2017. Tr $16.99. ISBN 9781338053845. Gr 5-9– No magic or monsters are needed to make the island fortress known as Slabhenge Reformatory a truly horrible place. Conditions are terrible and discipline is excessive, but Jonathan is so tortured by guilt he considers it no worse than what he deserves. Suspense and morality—and rats—combine in a darkly exciting tale. HYMAN, Miles. Shirley Jackson’s “The Lottery”: The Authorized Graphic Adaptation. illus. by author. Hill & Wang. 2016. Tr $30. ISBN 9780809066506; pap. $16. ISBN 9780809066506. Gr 9 Up– This full-color graphic novel gives the classic story an extra layer of dread; rather than using the spooky black-and-white inks we often associate with horror illustration, the artist employs a straightforward narrative style and sun-washed colors. What looks bright and wholesome is really dark and twisted at heart. MAFI, Tahereh. Whichwood. Dutton. Tr $17.99. ISBN 9781101994795. Gr 5-9– The companion to Furthermore sees pale Alice tasked with helping hard-working Laylee, whose job it is to bathe and bury the dead of her village. Laylee’s mother has passed, her father is mad, and her situation is going from bad to worse. Thirteen-year-old Laylee is a well-developed and relatable protagonist of color. SCOTT, Victoria. Hear the Wolves. Scholastic. 2017. Tr $16.99. ISBN 9781338043587. Gr 6 Up– Survival fiction—bloody and cold and starving and toothy—that works well as a hi-lo read. Kids who want scary but have no patience for demons and fantasy hunger for stories like this one. A storm isolates Sloan’s tiny Alaska town, and when her neighbor is hurt, a small band must make a desperate journey for help. Best read fast to avoid the plot holes. SMITH, Alexander Gordon. Hellraisers. (The Devil’s Engine: Bk. 1). Farrar. 2015. Tr $17.99. ISBN 9780374301699; pap. $10.99. ISBN 9781250090621. Gr 9 Up– Sneaky Mr. Smith writes parables of loyalty, honor, and trust disguised as brutal adventure novels full of grotesque demons in this hi-lo tale. Teenage miscreant Marlow gets a shot at joining a secret army of demon fighters, but at a terrible cost, and even greater risk. Stomach-churning descriptions will please the most bloodthirsty readers. BAILEY, Em. The Special Ones. HMH. 2017. Tr $17.99. ISBN 9780544912298. Gr 9 Up– He kidnaps teenagers and children and installs them in a ramshackle farmhouse, believing that they are the incarnation of some ideal “pure” family. And when they deviate from his ideals? He goes out and finds a replacement. A quick but truly dreadful read, great for true crime devotees. KUEHN, Stephanie. When I Am Through with You. Dutton. 2017. Tr $17.99. ISBN 9781101994733. Gr 10 Up– No collection that includes horror for teens is complete without a generous helping of Kuehn. Bad things happen in her books, and this one, about a school camping trip that runs into trouble, is no exception. KURTAGICH, Dawn. And the Trees Crept In. Little, Brown. 2016. Tr $17.99. ISBN 9780316298704; pap. $9.99. ISBN 9780316298711. Gr 9 Up– Nightmarish scenes play over and over in this hypnotic festival of misery from the author of The Dead House. Sisters Silla and Nori are on the run from their abusive father when they arrive at their Aunt Cath’s decaying mansion. But it’s a trap—the woods surrounding the property won’t let them leave. OH, Ellen. Spirit Hunters. (Spirit Hunters: Bk. 1). HarperCollins. 2017. Tr $16.99. ISBN 9780062430083. Gr 4-6– When your parents think that your family’s recent trauma will be mitigated by moving to a big weird house— just run away. Nothing good is going to happen. Harper Raine learns this the hard way, as her sweet younger brother Michael makes a new invisible friend in their new house—a bad friend. POBLOCKI, Dan. The Gathering. (Shadow House: Bk. 1). Scholastic. 2016. Tr $12.99. ISBN 9780545925501. Gr 3-7– Poblocki is quickly establishing himself among the ranks of reliable purveyors of spook. Paradoxically, this trilogy, written for younger readers than his previous books (The Nightmarys; The Ghost of Graylock), far surpasses them in creepiness. Five kids, one haunted house, and five animal-headed ghosts actively trying to kill them all. SNIEGOSKI, Thomas E. Savage. S. & S./Simon Pulse. 2016. Tr $17.99. ISBN 9781481443739; pap. $9.99. ISBN 9781481443746. Gr 9 Up– A fierce storm hits the island of Benediction. Amid the tumult, all the animals turn feral. Killer rodents. Extremely aggressive insects. And let’s not talk about the kitties. Sydney and her faithful dog Snowy battle their way across town and into the horrible heart of this sci-fi mystery. WESTERFELD, Scott. Spill Zone. illus. by Alex Puvilland. First Second. 2017. Tr $22.99. ISBN 9781596439368. Gr 8 Up– Teenage Addie takes pictures in the contaminated Spill Zone to support herself and her sister Lexa. But the Zone is off-limits for a reason, and when Addie is offered a lot of cash to retrieve a mysterious object, she comes face-to-face with some of its eeriest and most dangerous phenomena. Edgy art brings this graphic novel to life. Paula Willey is a librarian and blogger at unadulterated.us.